Steven (Chicagoland, United States) on 20 February 2018 in Architecture and Portfolio. The neoclassical Memorial building on the Tidal Basin off the Washington Channel of the Potomac River was designed by the architect John Russell Pope and built by the Philadelphia contractor John McShain. Construction of the building began in 1939 and was completed in 1943. The bronze statue of Jefferson was added in 1947. In 2007, it was ranked fourth on the "List of America's Favorite Architecture" by the American Institute of Architects. From the archives............photo captured May 5, 2010.
what a fine night shot of a beautiful structure. i've seen it many times in person, but never tire of it. Très belle photo nocturne sur cette non moins belle architecture. Very interesting and beautiful house. Gorgeous composition in this super night image. Beautiful composition and superb B&W ! One of the great sights of D.C., perfectly photographed and presented! Quelle coupole quelles colonnes et vue fantastique compo. very very beautiful...bathed in light !!!!! Superb shot ! A fine picture of this memorial. I liked the informative comment about how important Jefferson was. Black and white worked well on this photo. It allowed to put the Jefferson Memorial in full prominence. Luxurious black and white quality; a great call for this superb night shot. Beautiful night shot. Superb architecture. Stunning light in this image! That is a wonderful night shot. Excellent tones. lovely black and white tones; I don't think I have ever seen this angle before. 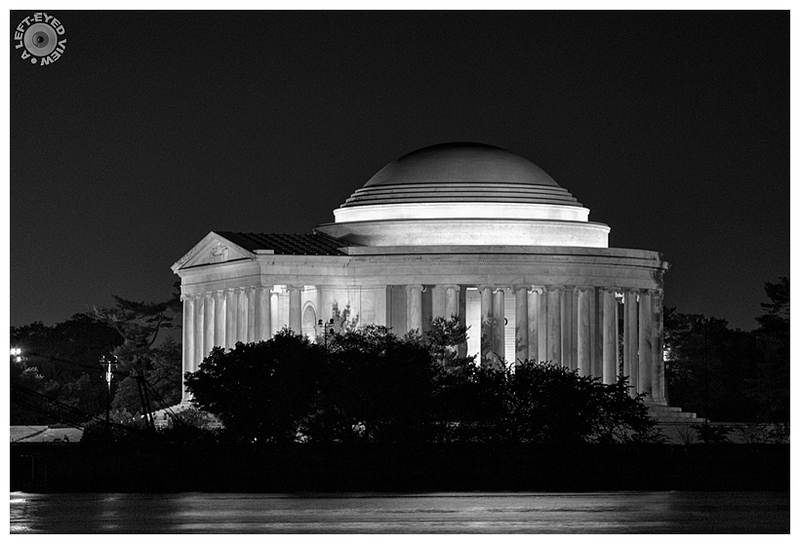 A gorgeous night image of the Jefferson Memorial. I love seeing it lit up at night. A beautiful black and white image! Lovely image - You did a great job with this night shot! My grandmothers' favorite memorial... She was a commissioned artist in the DC area - many people asked for her to paint the Jefferson. Her only question would be (in a soft Alabama accent...), "And what season would you like it? Spring with the cherry blossoms? Summer with the greenery? Autumn colors? Or awash in snow?"